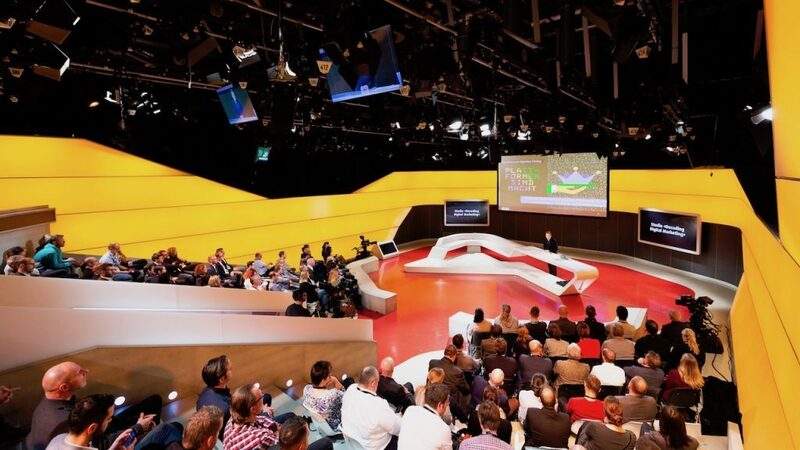 The premiere of BSI Studio took place in the studio of the Sportpanorama on Swiss television. The software orchestrates marketing automation across all channels: a radical simplification for marketers. Around 120 guests were present. And we from for​you​and​your​cu​sto​mers also presented our BSI story with the appropriate services. foryouandyourcustomers at the premiere of BSI Studio on Swiss television. The sliding doors of the television studio’s public entrance hiss apart, two friendly faces say hello. They wear black – the dress code of the BSI people today. The illumination of the red carpet alights, the first guests grin in front of the photo wall, the cameraman takes pictures. 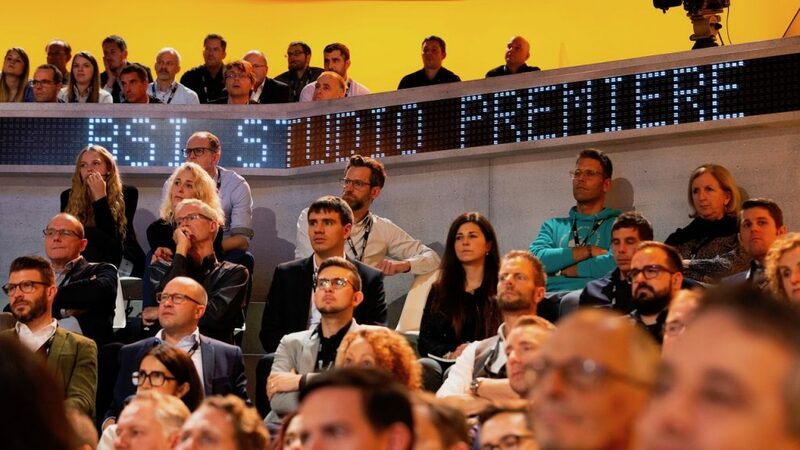 On this day, BSI invites you to the premiere of its “BSI Studio”, the premiere of software that will radically simplify the life of a marketer in the future. 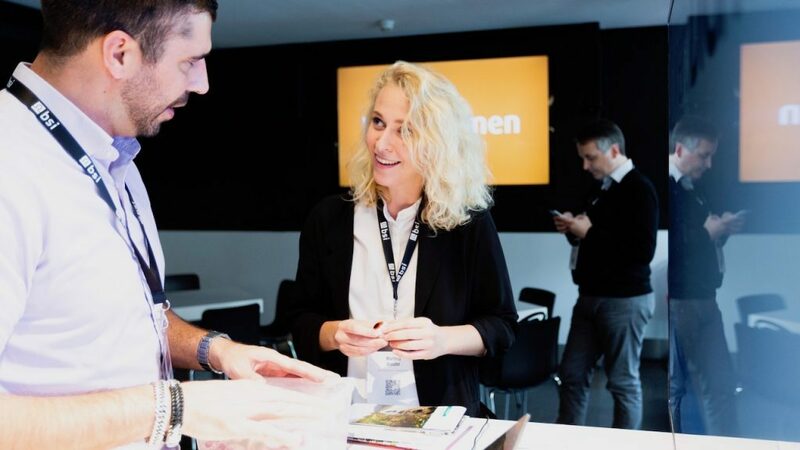 Even foryouandyourcustomers is involved: Martina Amsler and Sebastian Horat present the designed story “Professional customers become consultants” to the guests. A story that is consistently well received by the audience. It is intended to strengthen the community by inviting professionals to share their knowledge with the community and thus give customer advice a new quality. But let’s start at the beginning. BSI is a term for many when it comes to software solutions for CRM. In the further development of their product portfolio, they have recognised the daily challenges – and excessive demands – of marketeers and customer experience managers and have developed a clearly arranged platform with which customer stories can be created and automatically executed in a playful but no less sophisticated way. But the BSI Studio does not come alone. The Step Store complements the studio with tools, services and brains. In accurate terms, automation ideas – so-called “stories” – and strategy-defining workshops – so-called “services” – can be purchased in the store. These are partly offered by BSI themselves, but above all by partners with complementary expertise. foryouandyourcustomers presented in the studio of SF. Successful stories embed themselves in a sophisticated customer journey that focuses on the needs of your customers. We at foryouandyourcustomers were convinced by the new BSI software and the core idea. The application is surprisingly simple. The functionalities are well thought out. The software is groundbreaking in today’s and tomorrow’s human-machine interaction. And the platform or network idea is based on a good portion of relationship ability. To support the software, we offer our services. They help to orchestrate the stories and use them in a targeted way. Because successful stories are embedded in a well thought-out customer journey that focuses on the needs of your customers. Anyone who thinks stories without the corresponding target customer and employee journeys runs the risk of getting bogged down, increasing their expenses uncontrollably and diluting their brand image. To prevent this, we use BSI Studio to analyse customer journeys and create a unique customer experience in the form of a target journey. A target journey that is significantly supported by BSI Studio at the right touchpoints: The analysis and reporting facilitates and empowers marketers and customer experience managers in their work in a new dimension. The method for this is our proven ChannelOPERA, which we supplemented with the actual creation of the corresponding BSI stories. You can find out more about our services in the BSI Step Store. Martina Amsler, Multichannel-Consultant at foryouandyourcustomers.